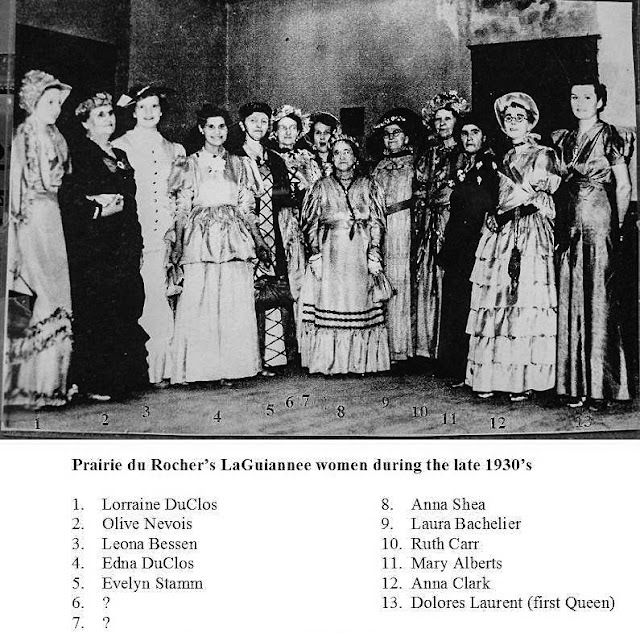 The Digital Research Library of Illinois History Journal™: The Midieval French Tradition, La Guiannée is celebrated on New Year's Eve, December 31st in Prairie du Rocher, Illinois. The Midieval French Tradition, La Guiannée is celebrated on New Year's Eve, December 31st in Prairie du Rocher, Illinois. La Guiannée (or La Guignolée) is a French medieval New Year's Eve tradition that is still practiced in two towns in the United States. The tradition related to poor people being able to ask the more wealthy for food and drink at the celebrations of winter. Revelers at a La Guiannée celebrated in Prairie du Rocher, Randolph County, Illinois, in the 1930s which is a medieval French tradition. Note the prevalence of French surnames among those gathered. The costumes replicate those of the original French settlers who founded the village and celebrated the first Guiannée there in 1722. Customarily a troupe of traveling male singers went from door to door to entertain and ring in the new year. Hosts were expected to give them food and drink. Other sources say the young men were seeking donations for Twelfth Night (a festival in some branches of Christianity marking the coming of the Epiphany (the manifestation of Christ, with tradition marking the date on either Januaty 5th or 6th). Begun as a way for the poor to be given gratuities by the rich, it also became a community social event for young men to visit with the families of young women. Over time, the practice became an occasion for visiting with relatives and friends and was more or less a traveling feast. At first it was carried on only by young men, often in costume; women joined the party in the 20th century. In many years, the people appeared in disguise, as part of the celebration was a kind of overturning of the common order. This tradition has been practiced annually since 1722 in Prairie du Rocher, Illinois. It has been revived in Ste. Genevieve, Missouri. Both were former French colonial villages settled by French Canadians in the eighteenth century and the villages are across the Mississippi River from each other. In Ste. Genevieve, Missouri, current celebrations feature singers and musicians, attired in colonial dress, who begin their night's journey at the local American Legion Hall. They make their way through all the restaurants, bars, nursing homes and high school gyms, ending at midnight at the Knights of Columbus Hall. Upon arrival at a local home or business the group sings two verses outside, and then when invited inside the entire song is sung. After the singing has finished it is local custom that food and drink are offered to the singers. The group then proceeds on to the next stop. And all who live with you. You owe us La Guignolée. A chine of meat or so will do. Only the oldest daughter of the house. And we will surely warm her feet. And beg you to forgive us please. We meant it in good fun. To know when we must come back here again.